The revival of retro toys based on the action figures of yesteryear is perhaps at its height right now — but one area where most lines are slipping up is in the distinct lack of retro playsets. Figures Toy Company is changing that with their line of retro DC action figures though, and it's off to a great start. Well, technically only one is a playset: Batman is getting a recreation of the classic mego Batcave from the 1970's, a massive 15" x 15" x 11" cardboard replica completely with a flashing Bat Signal for you to mess around with. 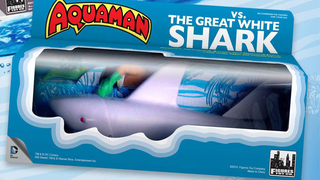 Aquaman though... well, he gets himself and a Giant Plastic Shark to fight and/or communicate with. Poor guy. This is exactly what I want from all these new-but-retro-again toylines: so few are just doing the cheap, tiny figures, and forgetting that just as much appeal was getting these elaborate vehicles and playsets to play with them all. There's just as much nostalgia in them than there is in the figures, and it's finally nice to see a company putting some out. The Batcave and Aquaman vs. The Great White Shark don't have prices just yet, but they'll be out later this year.